Happy Tuesday friends! Would you believe that I've been working on this post for over a week? Things have been busy busy busy. Sorry I've been a little unfaithful with the posting...I think that maybe subconsciously I was hoping that someone somewhere would get inspired to comment on the wedding invite post before I shadowed it with another house post but, alas, here we are, and there sits that last post, commentless. So you like house posts more? Okay. I can roll with that. I mean, I'm totally still going to post about the wedding, and all the wedding details, and all my wedding feelings...but at least I'll be thinking about the fact that you would prefer something different. And it is, after all, the thought that counts. Right? Right. All kidding aside, today I am thinking house. I am thinking about the most important part of the house. I am thinking about the bathroom. Our first and foremost concern with the house is to get the bathroom in working order. And that's simply because, well, you gotta do what you gotta...nahh. This is no place for potty talk. Moving on. 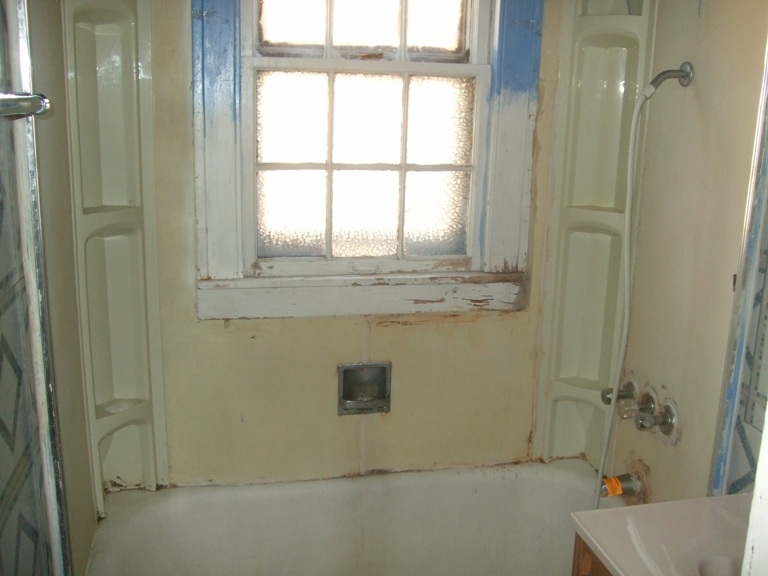 The bathroom required a complete gutting and redo. Aside from the, uh, "unique" decor, the room was cramped, the fixtures were old, and the plumbing needed redoing. 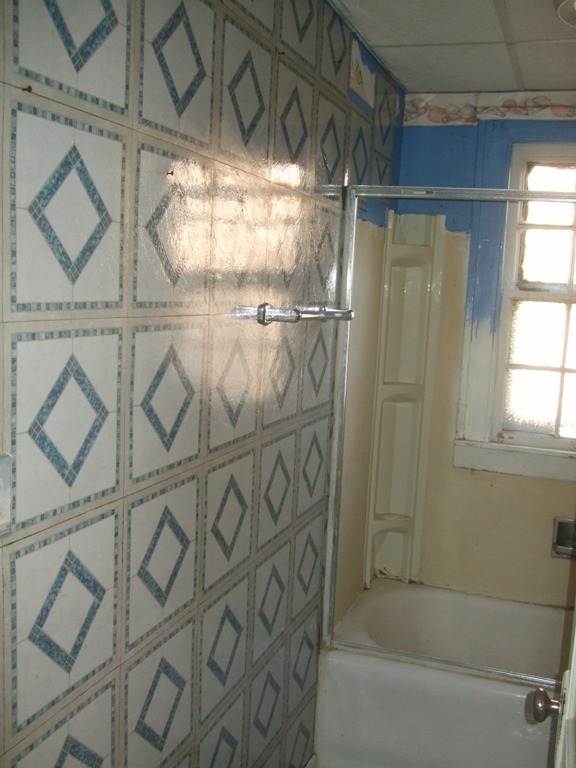 I know I showed you at least one pic of the bathroom when I posted all of the house's "Before" pictures, but let's take a gander at a few more, shall we? Hopefully between the pictures and my explanations, you'll get a feel for what we're doing and why we're doing it. 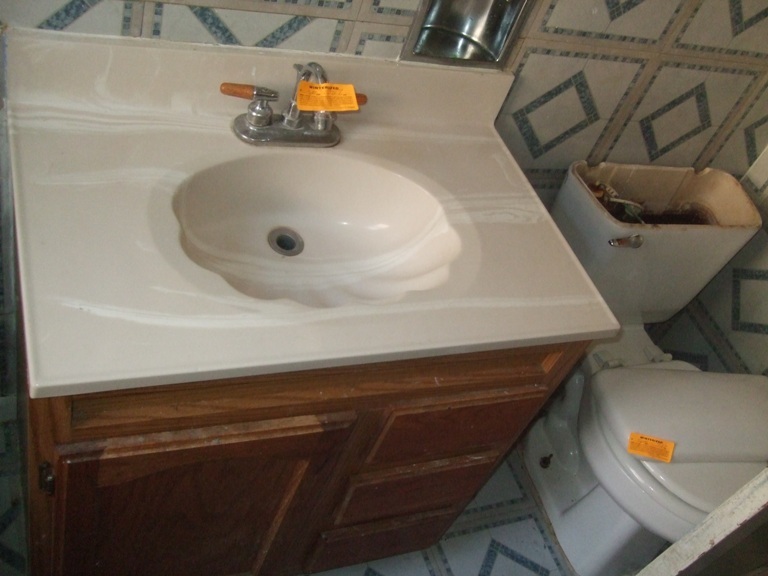 The most obvious issue with the bathroom was the "slightly" grungy fixtures. The bathtub -- cast iron and about 600 pounds -- was begging to be allowed to make its exit from any further duty. I dismissed it, and it is now sitting in our backyard, awaiting a trip to the scrapyard. The toilet (seriously, who doesn't love this picture!?) was, for lack of a better term, "yucky," and had a constant bubbling issue going on. I don't know why it did that, but it freaked me out, and I was okay to see it go. Once it did, we found that the floor beneath it was in pretty bad shape, and we would need to help our house out in that area. This picture does me the favor of highlighting all three of my big complaints with the original bathroom. We've already talked about how much I love that tiled floorwall. Yum. And then there are the oh-so-fancy fixtures, two of which are featured here. The countertop isn't in that bad of shape...but I've never been much of a fan of the clam shell look. I don't know why. I wasn't really down with Ariel or the rest of the mermaids, and apparently those feelings translated into decor. If we ever decide to put in a half bath, a little paint for the cabinet and a new faucet might bring that sink back to life...we'll see. The third big problem with the bathroom was how cramped the space was. Can you see that slanted piece of wood in the bottom right hand corner of the above photo? That's the door. Pushed up against the rim of the toilet. Now...Dan and I are both on the taller side of the spectrum, and that, of course, means that we have knees. Right about in the middle of our long-ish legs. Actually, Dan has a super long torso...so his legs aren't extravagant, but they're still long compared to most. Either way, a toilet & door situation such as the one pictured here is not a good thing. If someone were to walk in on someone else (highly likely due to the lack of a lock) the latter would end up not only embarrassed but also with banged up knees. Here are a few more pictures that might give you an idea of our tight space.. Tight tight tight! 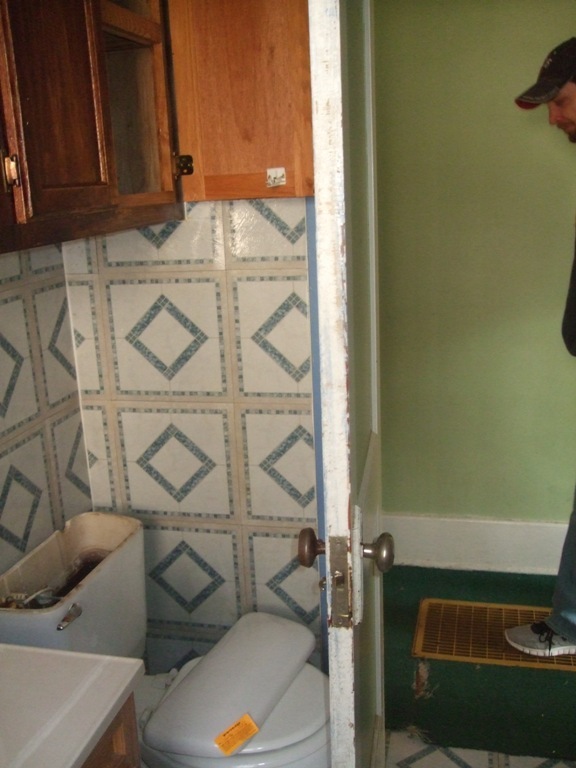 Luckily for us, this bathroom was flanked on both sides by closets that were two feet wide. That meant we could take out some walls and do a little expanding for the new bathroom. 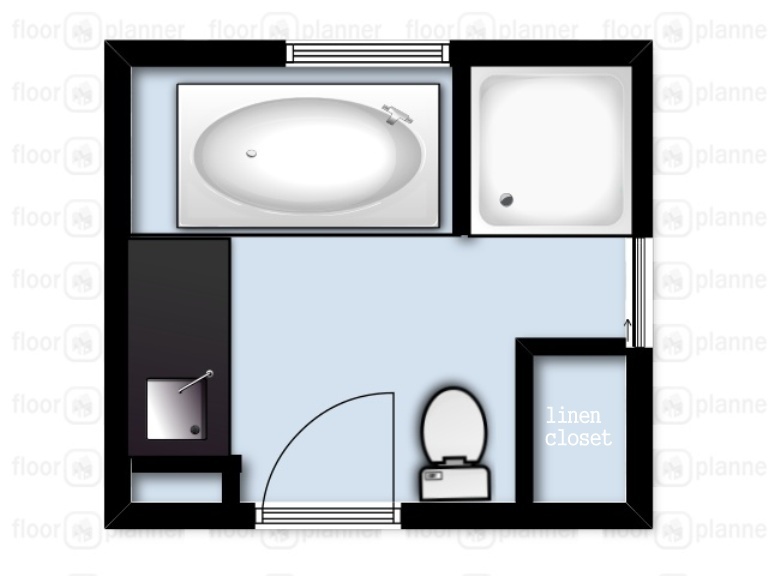 I used this site to create floor plans of the original bathroom and the remodel. 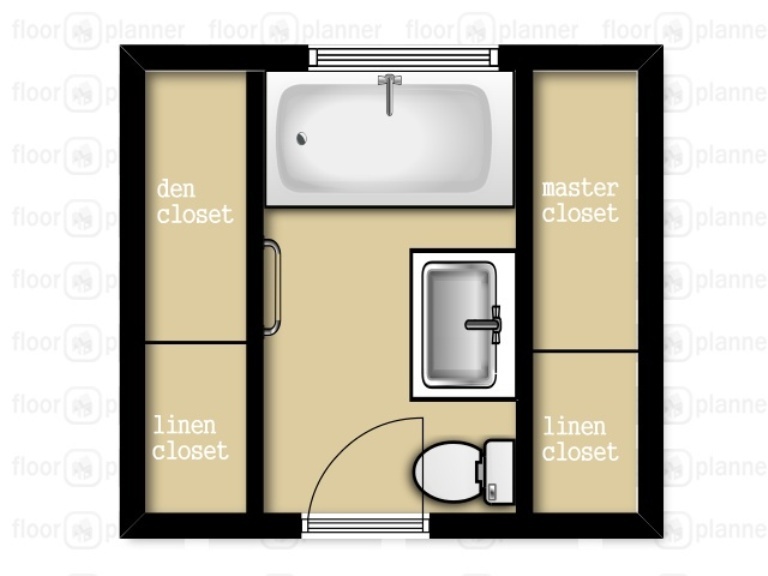 The extra space from the closets left us able to have separate tub and shower spaces (love.) and the room feels so much better, so much more open. (Yes! Feels - present tense! This task has really been rolling. There is already primer on the walls, we just need to paint, tile, and stick in the fixtures. Boom.) We put a pocket door in where the old master closet used to be, allowing us easy access from the master bedroom. And turning the toilet freed us from the awkward knee situation. We were able to update all of our fixtures...but I think we'll save those details for the final bathroom reveal. For now, I'll just leave you with the idea and let your imaginations run wild. Sooner than later, you'll be able to see the final product. Meanwhile, I have some painting to do. Jess, you should know that I read your writing in your voice. Feel special. I love that I can laugh when reading about mermaids and toilets. Odd combo but you made it work. I myself have never understood the "clam" sink thing.. I'm guessing that it originated in someone's corny beach house. LOVE the new blueprint. So much more roomier, which is needed in a bathroom (and also in a kitchen). Also, I like to see you using "y'all" Bring on the poor Southern grammar. Just the "I read your writing" part makes me feel really special. And I CAN'T WAIT until you can see this for yourself!! jessica do not grow discouraged people do read these but blog spot just has a really intimidating comment system you have to have an account and rememeber your password i am sure there are more reading then the comments show. also blogspot have taken the liberty to assume some evil robot is trying to infiltrate your blog. but don't worry they have sucessfully locked him out with tight security precautions. sadly they have also block out the lazy the dyslexic and the blind. ok, call me a moron, (loud voices shouting "MORON") but what is that thing on the left wall? the sink? I mean... you should have a sink, so that would make sense... but the whole birds eye view thing is trippin me out! How exciting! I hope I have a DIY home someday. You seem to be doing a phenomenal job, by the way! The floor plans look awesome and sound pretty darn cheery about it all. I would probably be exhausted and stressed out. Keep posting pictures! I'm obsessed with anything DIY/home related, and its even more fun when I actually know the person!